We have a wide range of templates available at the website which are compatible with the latest version of Joomla. To find out more information visit the gallery where each Joomla template is clearly labelled with the badges as show below. If you have any questions about the compatibility of the template we have designed at the website for Joomla please feel free to contact us and we will be happy to answer any questions you may have. All the templates we have created for the latest version of Joomla 3 are fully responsive which means the template will automatically adapt or fit to your website visitor’s computer, tablet or smartphone device screen size. Weather your website visitor is viewing the website using a computer screen, tablet or smartphone the responsive template we have created will automatically adapt (fit) to the screen size the visitor is using as shown the image below. You can view the mobile friendly templates we have designed at the website in two different locations. If you have questions about the above please feel free to contact us. We have worked very hard to ensure each Joomla template we design at the website is both really easy to use and customize to help you create a unique website. At the energize themes website each template we create at the website is designed to make your life easier. You don’t need to touch the CSS code or PHP code to customize the design you can do everything from the easy to use template control panel. You can upload your website logo, customize the template colour scheme and so much more using the user friendly control panel. Each template comes with our easy to use template quick start package which allows you to create an exact copy of the website and template you can see running at the template gallery. The quick start packages allows you to quickly and easily get your website online in a matter of minutes. We supply the original Adobe Photoshop file so if you want to customize the template to present to a client you can do this using the Photoshop file. Each template comes with a standard set of module positions which gives you the freedom and flexibility to publish the modules you create anywhere the website. On average each template supports between 40 to 50 fully collapsible module positions. We take great pride in in providing our customers with a personal one to one support service to ensure they get the best out of each template we create at the website. We understand each person has a different set of skills. Some are highly experienced web designers some are just getting started with web design. Whatever your skillset is our professional and friendly support team is here to help you. The Joomla templates we have created at the website are not just for individuals or businesses who want to build a professional website they are also great for freelance web designers and web design agencies. You can use the templates we have available for download at the website to build your clients website. If you have any questions about this please read the terms of service or feel free to contact us and we will be happy to answer any questions you may have. There is no time limit on the templates you can download at the website. Once you have downloaded and installed the template at your Joomla website you can use it forever. If you have any questions about the above please feel to contact us at the website. 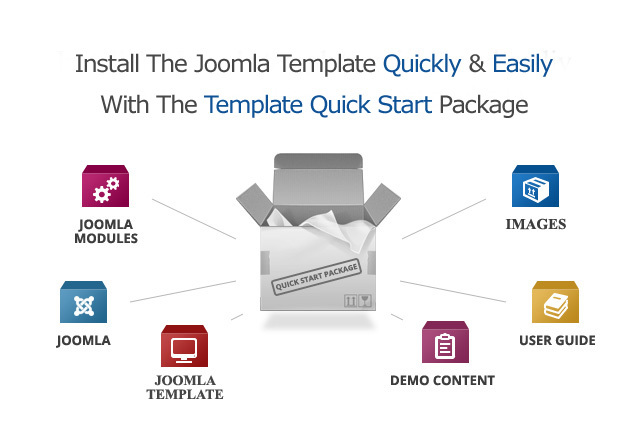 All the Joomla templates we have available at the website come supplied with the quick start installer which allows you to easily setup an exact copy of the template and website you can see running at the template demo site. The template is setup and ready to go as shown at our demo site. After you have installed our easy to use quick start installer package via your web hosting provider all you need to do is change the website settings, content, images and template settings to suit your needs and your website is ready to go. We have created a number of Joomla shop templates at the website which have been specifically designed for building a store for your website. Each shop template available for download at the website is styled for the popular Virtuemart e-commerce exetension which seamlessly intergrates with Joomla to provide you with a complete e-commerce solution for you website. Virtuemart comes with everything you need to run a shop online and is one the best free e-commerce extensions you can use for Joomla. It has a great support community and is used by thousands of websites around the world to sell products online. Visit the Gallery to view all the Joomla shop templates we have created at the website. We understand not everybody wants to join a template club which is why we also offer the option to buy a single template at the website. Purchasing a single template comes with all the same benefits as the club membership packages we have available at the site. You still get access to support via our help desk plus you also get the original Photoshop PSD files, installation guide, quick start package and much more. If you’re looking to buy just one template for Joomla then complete the order form at the site. The k2 extension is one of the most popular Joomla extensions available for download plus it’s free and used by thousands of websites around the world to extend the features and functionality Joomla has to offer. The k2 extension takes Joomla to a new level in terms of managing and creating content at your website. The out-of-the box features include the ability to use additional fields for articles including images, videos, image galleries and attachments within articles and much more. It also supports nested level categories, tags, comments, user forms, ACL, frontend editing and alot more. To sum up k2 will transform the way you manage, structure, update and publish content to your website. We have designed a number of K2 templates at the website which have been specifically created to support the extension. Each template comes with custom CSS styles and HTML overrides to ensure k2 is fully integrated into the templates we have created at the website. Before we release a new Joomla template at the website we complete detailed testing to ensure it works correctly with the following web browsers noted below. If the template includes support for responsive, mobile ready layouts then we will also complete testing across Apple iOS and Android mobile web browsers. Please note the templates are not compatible with Microsoft Internet Explorer 6 or 7 which are now close to 7 years old and are no longer supported by Google, Microsoft, Facebook and many other large sites. If you are using Microsoft Internet Explorer version 6 or 7 we recommend you upgrade to the latest, stable and secure version of the browser. Before buying a template or joining the club we recommend you visit the template gallery to fully test the design you wish to purchase at the website to make sure you are happy that the design works how you expect it to work. You will not be automatically billed after your subscription has expired. If you would like to renew your subscription with us you will need to manually renew your subscription by logging into the website with your user name and password to make payment via PayPal.com to renew your subscription. If you have any questions about the above or have trouble renewing your subscription at the website please contact us. We only accept payments via the paypal.com website which is a safe and secure way to purchase products and services across the internet. You do not need a Paypal account to join the template club or to purchase a single web design at the site as Paypal accepts all major credit and debit cards. Please note we do not process any credit or debit card payments at the website. All payments are processed via the paypal.com website. All the templates available for download at the website come supplied with the original Adobe Photoshop psd format source files. The Adobe Photoshop file is great for web designers or web design agencies who need to customize the image work included in the original Photoshop psd file to present to the client before making any structural, code changes to the template. Please note you will need to download and install the Adobe Photoshop software in order to edit the Adobe Photoshop file which comes supplied with each template we release at the website. If you are new to using Photoshop we recommend you visit one of the following websites which includes some useful step by step tutorials about how to use the Adobe Photoshop software. You can view all the Joomla templates we have created at the website by visiting the template gallery where you can fully test all the designs we have at the site across the various web browsers plus you can test the functionality of each design with Joomla. If you have any questions before purchasing a template please feel free to contact us at the website. We provide all customers with personalized one to one support via our help desk. To help us give you the best possible service and resolve your issue as quickly as possible please include the following details in the support ticket you open at the website. Joomla version you have installed at your website. Let us know if you have installed Joomla yourself or you are using the quick start package. If you have made any changes to the original template you have downloaded at the website, please let us know about the changes you have made. The web browser you are using where the error appears. For example Internet Explorer, Firefox, Chrome or Safari. If you have installed any 3rd party extensions, modules or plug-ins at your website, please let us know about them. We may ask you to create a temporary Joomla super administrator account at your website for us so we can log into the site and investigate the problem for you. Once we have resolved the issue you can easily remove the temporary account from the website. Please note the Help Desk ticket you open at the website is private and confidential. Only you and our support team can see the ticket. You can modify the source code for the template you have downloaded at the website to get the look and feel you want. The aim of a template is to provide you with a foundation to build upon and customize if required to your specific needs. We have tried to make the templates at the website as easy as possible to customize by providing customers with the following. Built-in template control panel allows you easily make changes to the design including the color scheme. We supply the Adobe Photoshop file which you can use to customize the image work for the design. We have included comments in the template CSS file so you can understand how design is structured. We like to keep things simple for customers. We don’t believe in releasing bloated, over complicated designs which only skilled web designers can use which is why we try very hard to make them as easy to use and customize as possible. We have tried very hard to ensure each Joomla template we develop and release at the website is as easy to use as possible. We understand that not everyone is a web designer with the skills and knowledge to code PHP and CSS which is why we have incorporated a number of easy to use built-in features into the control panel which comes supplied with the template to make things easy for you. Color customization tool – This allows you to easily change parts of the template color scheme via the control panel. You can change the font color, design background, menu links, header background plus much more all via the control panel. Changing the logo – You can easily upload your own logo image, site title image and slogan image via the control panel which will appear in the header area of the template. Each template also comes supplied with the Photoshop source files which you can use to customize the image work plus the CSS files include comments to help you understand how each CSS element works. If however you do require specific customization work completed on the template you have downloaded at the website please visit the template customization services page to view the sevices we have available at the website. If you have forgot the user name or password you used when registered an account at the website you can easily reset your password or user name by visiting one of the following links below. If you do not know your user name or password or the email address you used to register an account at the website please contact us. If you get the message Account Locked when you try and log into the website please make sure you have clicked on the activation link included in the welcome email you have received when you registered a new account at the website. If you have clicked on the account activation link and you still get the message Account Locked please contact us at the website. If you have not received your activation email after registering a new account at the website please check your spam folder as the email may have been flagged as spam. If you have still not received your account activation email please contact us at the website and we will be happy to help you further with this.